I admit, I wondered if the DC Universe really needed a Green Arrow/Black Canary series, and Road to the Altar, while enjoyable overall, really didn't put the value of this series over the top for me. 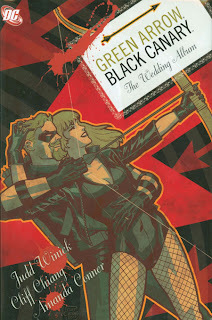 In Green Arrow/Black Canary: The Wedding Album, however, regular writer Judd Winick returns, and he writes a story that's so sharp, so easily moving, that this series is now on my must-buy list. Winick writes a Green Arrow/Black Canary story here that, with it's exotic locales and daring escapes, seems almost more suited for the bride's family, Birds of Prey, than the groom's. The main story is helped tremendously by Cliff Chiang's art, with wide open lines that give equal majesty to urban rooftops and tropical islands. The Arrow family must free the kidnapped Oliver Queen in a heist operation that's far more Indiana Jones than Ocean's Eleven, but just the big-screen nature of it is a joy to behold. This story also contains an amazing amount of emotion, perhaps far more crying and bemoaning of past bad choices than the Green Arrow title's ever seen before. It's to Winick's credit that he makes this work, in part by portraying Ollie as the next step in his evolution as a fighting liberal hippie; as tough as Ollie is, he's not afraid to express his emotions (even, as his family teases, to the annoyance of the people around him). This makes for a story that gets surprisingly sappy quickly, but also that contains far more depth than just a smart-talking slugfest. I was additionally impressed with how Winick used the rest of the DC Universe in this story. The Green Arrow/Black Canary wedding featured a who's who of heroes, of course (though at times Amanda Conner's art became so cartoony I had trouble telling some heroes from others), but Winick also remained aware throughout the issues of Green Arrow's long history as a hero, and Black Canary's place in the Justice League. Hal Jordan appears to be a regular fixture in this title, as well he should be, along with Batman; it was also quite moving when, in a fit of desperation late in the story, Ollie cries out to Superman for help. Oliver decides to retire his Green Arrow persona toward the end of this story, a move that I doubt any reader believes will actually remain the case. Having Ollie retire, however, opens Winick to hold a real wedding in the end, that of Oliver Queen and Dinah Lance rather than Green Arrow and Black Canary. I felt at the beginning of this book that the wedding ceremony passed too quick; we learn at the end that it's because Winick saves the best for last. It's not just the first chapter, but this entire book that's a wedding album, and Winick exceeded my expectations for this tale. The Green Arrow/Black Canary wedding action doesn't stop, as we check in next with the Justice League ... or, that is, the Injustice League. See you soon!